I know it was me who said, “hayyyeeelll no…I am not going for another bike ride”…but much like childbirth, I am back in the saddle again. 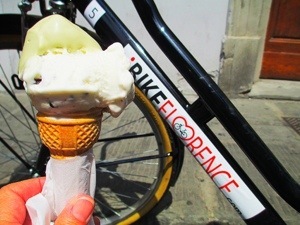 To better get my bearings on Firenze, I thought sticking with my plan of a city tour via bicicletta would be worth any pain it might inflict. And once again, my instincts proved to be right. I got up a bit early and left my B…. 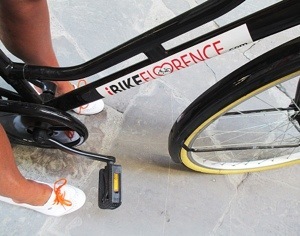 (no & B included with this one) in order to find the meeting point without feeling frazzled. No problems there. Once again, Roberto steered me right. I chose to do several “tours” with Florencetown. I check in. Claudio tells me I am a bit early (go figure) and I might want to grab some breakfast. 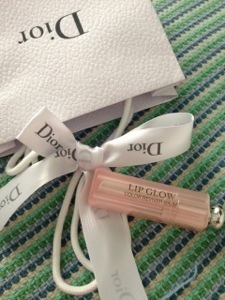 As I walked to the meeting point, I noticed a Sephora like place that I might be able to grab some lip balm. Since my arrival in Italia, I am fast going through lip balm and deodorant and am in need of both. Lip balm, check. This recommendation is per Avery. Only the best for her I guess. 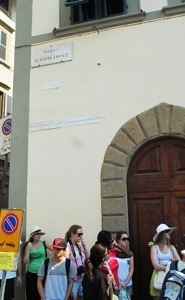 I return to meet the rest of my group and Giulia, our guide (picture a frizzy haired Giada with less chest bared). I will share with you the highlights. 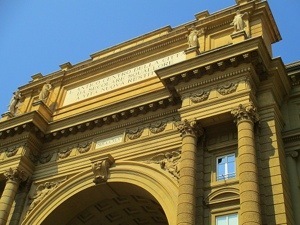 Our first stop is at the City Centro and Piazza della Repubblica. 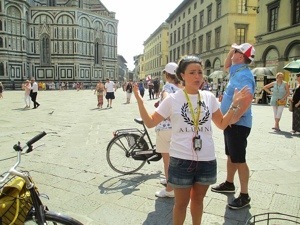 Here, Giulia tells us about the origin of Firenze, it’s original Roman lay out and the rejuvenation when Firenze was the capital of Italy. “We-a did-a not-a want to be-a the capital-a….we-a wanted to be-a…..uuummmmm….more laid-a back-a.” The “we” including her with the 1895 population. 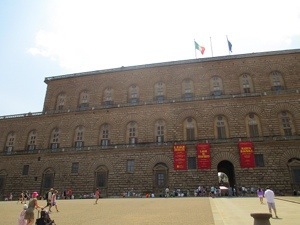 Also the fact that Florentine people do not like this piazza very much because it is too new…..1895 is “too new”. 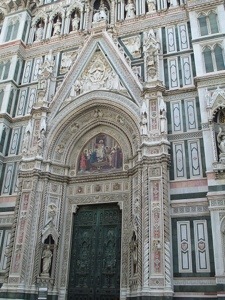 From there, we took a brief look at the Duomo. 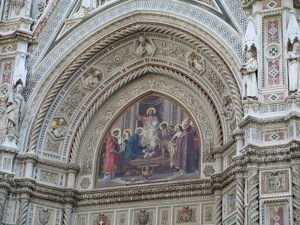 As Giulia tells stories, she poses questions, “Who-a do you-a think-a that eeesa on either side-a of Mary? Saints-a? 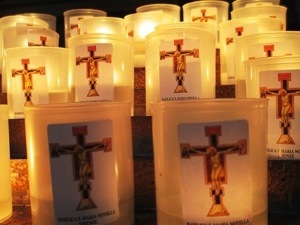 Popes-a? 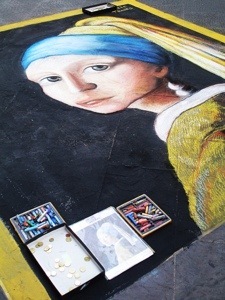 No-a in a Firenze, we-a want to show-a off-a our artist. 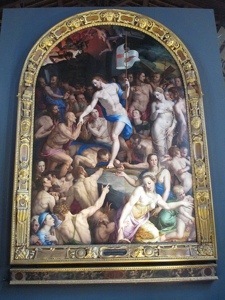 So on-a a church-a we-a put-a our most beloved artist-as”. Pretty cool (and odd), I did not know this. 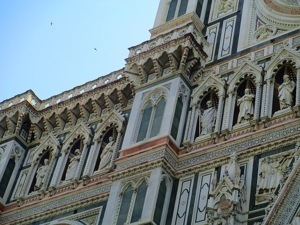 Here, Giulia tells us about the two major floods of Firenze. 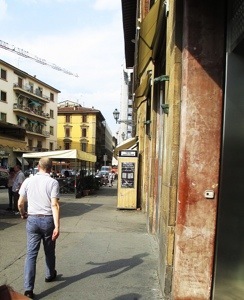 The signs below the street sign mark the years. The highest and last being in 1966. 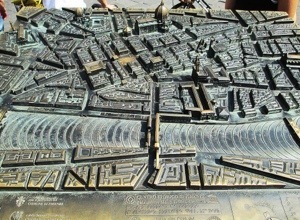 From there we pedaled over to Santa Maria Novella. At each stop, Giulia shares interesting information that is impossible to remember. Here are some interesting tidbits about the ironworks on the side of this palace. 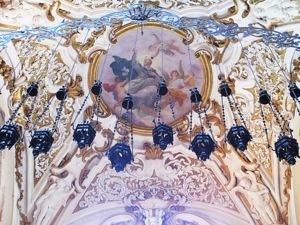 Some of the iron work was for laundry, while other was used to hang cages of birds and monkeys. Giulia says it was “in fashion” to have monkeys during that period. 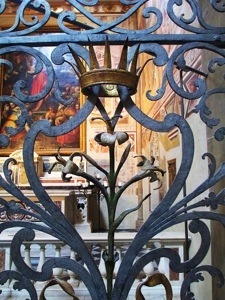 The Medici family even had lions in some of their cages. 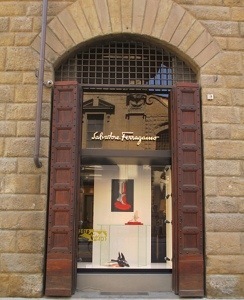 Now this building (Feroni Palace) houses the Salvatore Ferragamo Museo….fitting. 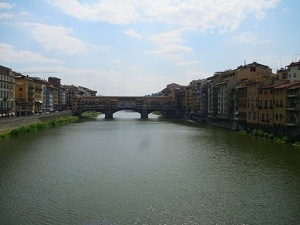 Next stop, Ponte Vecchio…first we admired from a distance on Ponte Santa Trinita. 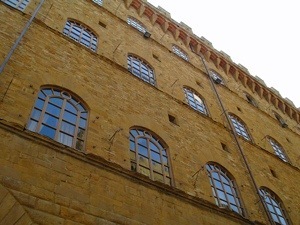 Ponte Vecchio used to house butchers. 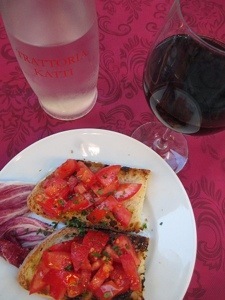 The butcher shops would used the water of the Arno to dispose of their waste and runoff. During WWII, Ponte Vecchio was the only bridge in Florence not destroyed by the Germans. It is said that this was due to orders by Hitler himself. The bridge conceals the Vasari Corridor. This corridor was built and used by the Medici family so that in Giulia words, “They-a deed-a not-a have to-a mix-a with the common peoples. They-a could- a walk and mmmmmmm….spy-a on-a the peoples.” Hitler supposedly wanted to walk this corridor as well. Then we got up close and personal with the bridge, pushing our bikes across….as we did, I thought…been here, done that. Side note, Mothers, let’s continue to teach our daughters how to present themselves (and us) well. 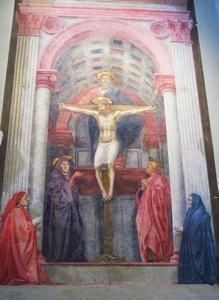 Santo Spirito. 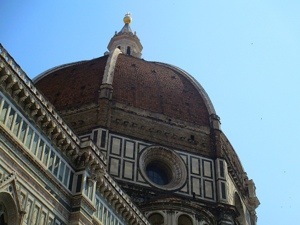 Filippo Brunelleschi, the mastermind architect that created the dome of the Duomo, began designs for the building in 1428. 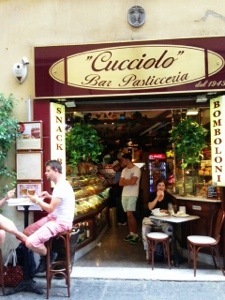 We were a few minutes ahead of schedule so Giulia let us go in for a brief visit. No photos were allowed, but of course, it was beautiful. 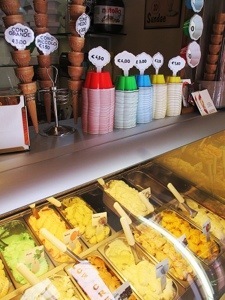 Time for a gelato break. The bike tour lasted about 2 and a half hours ( so much more that I know I am leaving out) and gave me a much better feel for the city. 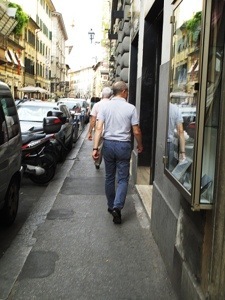 After leaving Giulia, I was comfortable navigating the streets. 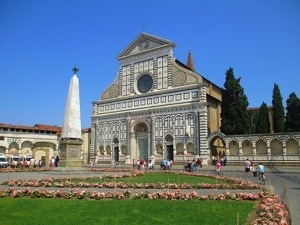 Although I am getting hungry, I decide to visit one of the major churches, Santa Croce. 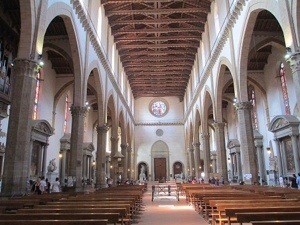 Santa Croce is the principal Franciscan Church in Florence built in 1294. 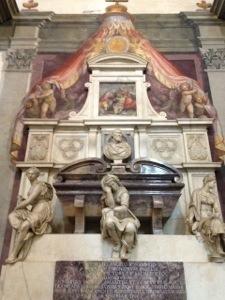 It is also the burial site of the “Great and Good for Florence”; Rossini, Machiavelli, Galileo and Michelangelo to name a few. 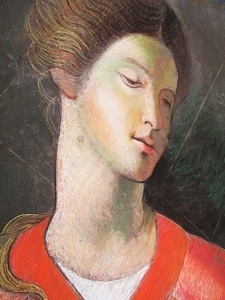 Dante also has a tomb dedicated to him but does not contain his remains. The building is too massive and impressive for me to share it adequately. I will simply share a few personal highlights. 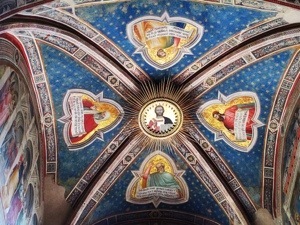 This is a ceiling in a minor chapel. 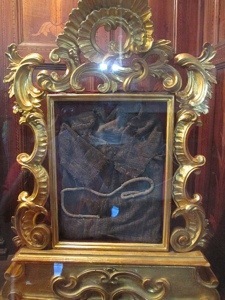 A piece of Saint Francis’s robe. 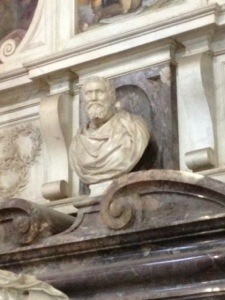 And the tomb of Michelangelo Buonarroti. 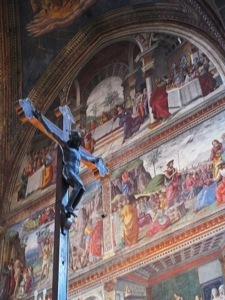 Below his tomb are statues representing painting, sculpture and architecture, mourning his loss. 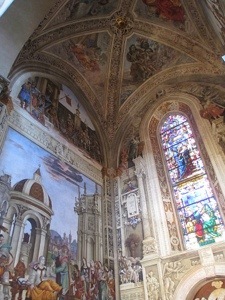 Looking toward the altar which is currently have restoration work done. The size and scale of this place is dreamlike. 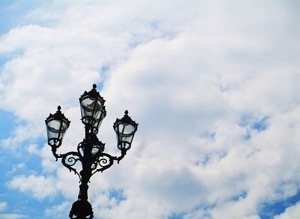 It serves it’s purpose of making man feel small in the scheme of things. 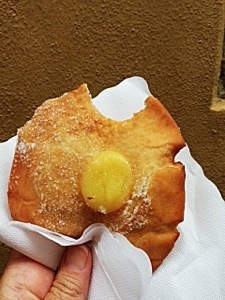 I don’t know about you, but Ho fame…so, time for a bite. And I am ready to continue on. 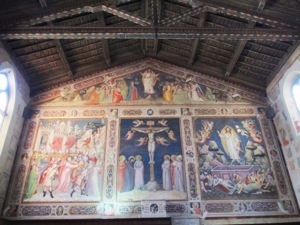 Back to Santa Maria Novella. 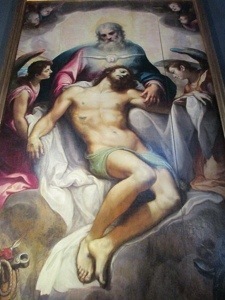 I think I have mentioned before how I am touched by images of the Trinity. 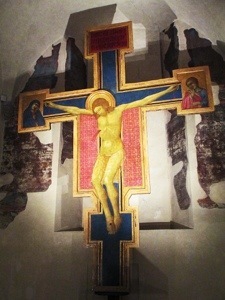 I have one in my bedroom, a photo taken in San Gimignano during my first visit with Mom and Jim. 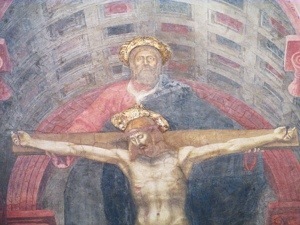 This one is by Masaccio, The Trinity. 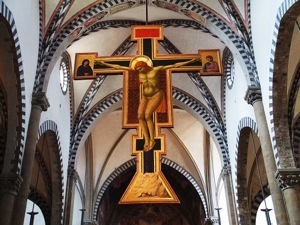 And of course, The Crucifix, by Giotto, (1288-1289). 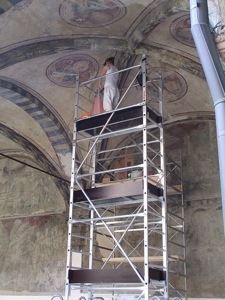 Restorations continue. Can you imagine being trusted with work of this magnitude? A reminder…Roberto is the proprietor of my B…picture a mix between Michelle Baryshnikov and Anthony Hopkins…I know….but it works. That is…if he is GOING to the B…which he was not, but I got close enough. I clean up, throw on one of my MVPs, a Rachel Pally maxi, and head out. I think I am just going to dinner, but instead I decide to chase the sunset. 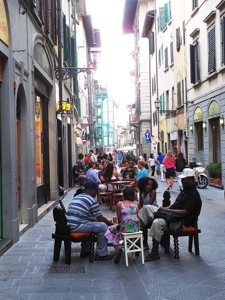 I have to say, I LOVE this practice of just moving your furniture out into the streets to enjoy the evenings. I say we bring it stateside! I am happy and I have chills!! 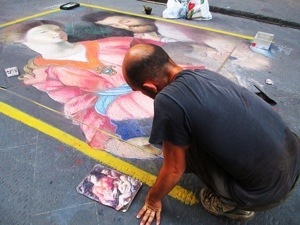 A different artist, not quite as good, but still impressive. And where do I end up? Correct, the place I thought I would not return to…but I am glad I did. 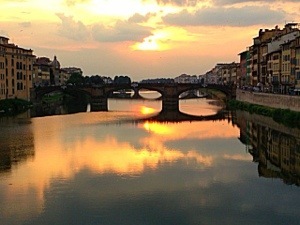 Florentine Sunset from Ponte Vecchio. 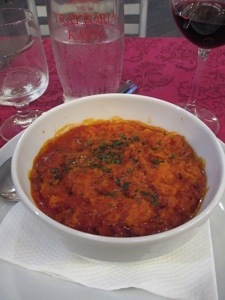 OK, I am sure you are getting tired of reading this so I will make dinner quick. A little vino. 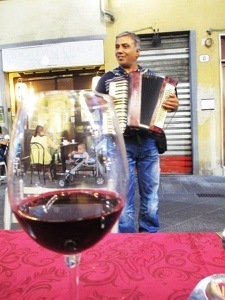 A little musica. A table of young Germans to my left. A family of Russians to my right. Nicotine enjoyed by all. We could have fun on a trip together! Just like the old days! 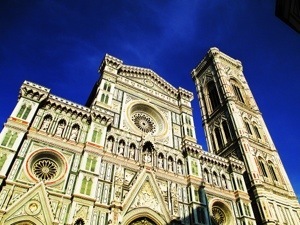 I remember both of those churches from when Jim and I went to Florence! 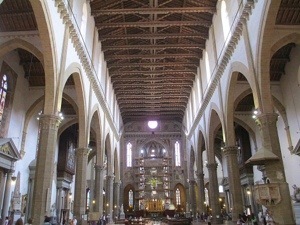 We went to mass at Santa Croce after we took a three hour walk around the city and Jim cracked his tooth at Santa Maria Novella. Your picture of the sunset is beautiful! 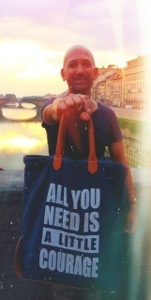 And how perfectly fitting that you ran into the guy with the “All You Need Is A Little Courage” bag. I’d say you have more than a little! So brave, so brave!! 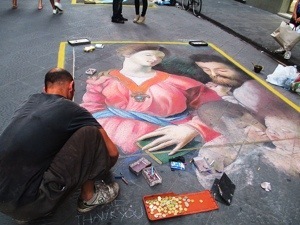 You need to see the sunset from Piazzole Michaelangelo-one of our favorite memories of all time.